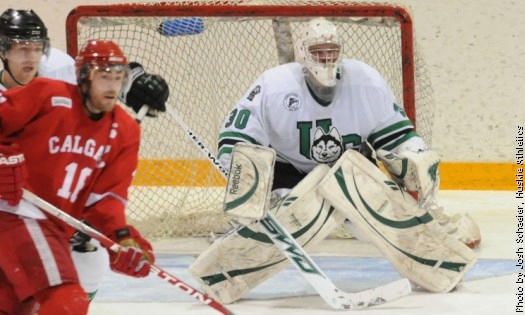 ﻿ ﻿﻿﻿ One of my all-time favorites David Reekie is pictured on the left playing for the University of Saskatchewan. Through six games so far this season for the Huskies, Reekie is 3-3 with a 1.91 goals against average, and a .945 save percentage. Thanks to the blog reader who sent me this information. You can click here to read the article. Reekie is one of those players that I get emails all the time from fans asking me if I've heard any new news about him. He certainly left an impression on the fans here in the short time he played in Lincoln. -Former Stars defenseman Colby Cohen made his NHL debut last week for the Colorado Avalanche. Click here to read more (bottom of the article). -Ryan Dzingel update! Dzingel and his Team USA teammates won yet again last night at the World Junior A Challenge in Penticton, British Columbia, Canada. This time it was a 5-1 win over Team Sweden. Dzingel did not have any points in the game, but the important thing is that Team USA is now 3-0 in the tournament! Click here to read more about the win against Team Sweden. With the win, Team USA has moved on to the semi-finals. -I will touch on this more in the weekend preview article that I'll post sometime tonight, but remember to arrive at the IceBox a little (or a lot) earlier than normal this Friday night for the home game against the Tri-City Storm. The UNL men's basketball team will be playing their home opener at Devaney that same night starting at 7:00pm, so traffic and parking could be a mess. The majority of UNL basketball fans probably won't know where to park, and will have to pay to park, so that could slow down movement coming into the area even further. Be prepared! -Finally, another former Stars fan favorite Brandon Bollig helping out at a Junior IceHogs practice last week. Bollig is currently playing for the Rockford IceHogs of the AHL. Click play below to watch the video. Good luck to the Stars tonight against Tri City. Last weekend they proved they can beat anyone when they all give their best effort. I will be cheering for them at home watching them on my computer.